I don’t know if you ever have bought or wear a corset. I found this great website online called CorsetChick.com. They have a lot to offer corset tops, lots of plus size corsets, corset dresses, underbust corset, costumes, and even shoes and boots. What I was surprised at was the large selection they have. 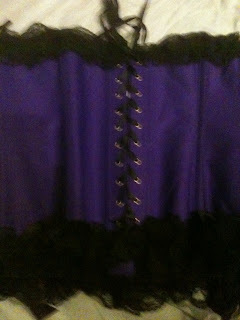 I ordered the Purple Fairy Dryad Corset. I was excited to get it and so was my boyfriend. Too bad I am saving it for a special weekend at the coast. Look at how pretty it is. Lots of detail. When ordering you really need to look at the sizing charts as the sizes do run smaller than most. They have something for everyone. I also have to say that they have great customer service. I had ordered something not too long ago and it was out of stock. So when I called customer service the person who helped me was great! What I ordered could not be back ordered so she offered to refund my money. I saw that the money was refunded in minutes of getting off the phone. The prices are very reasonable and the quality is great. I am sure anyone could find something at CorsetChick.com. 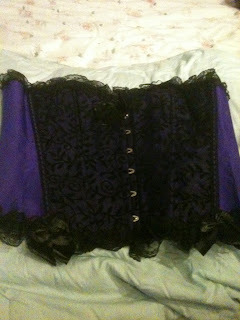 CorsetChick.com has offered one of my readers a corset worth up to $30. All you need to do is fill out the form below. Leave a comment on what you liked best at CorsetChick.com and follow Kaisy Daisy’s Corner. Each way you follow is an extra entry. The contest is open to 18+ US. Ends Jan 29, 2012.